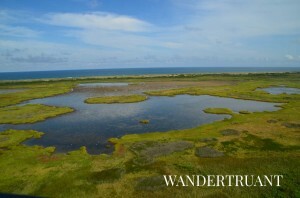 My Outer Banks exploration continues, following climbing the Currituck Lighthouse and seeing the Corolla wild horses. The Bodie Island Lighthouse was the next lighthouse that I wanted to visit, being only a short drive from the hotel in Kitty Hawk. The lighthouse is located on Bodie Island, just south of Nag’s Head near the Oregon Inlet. 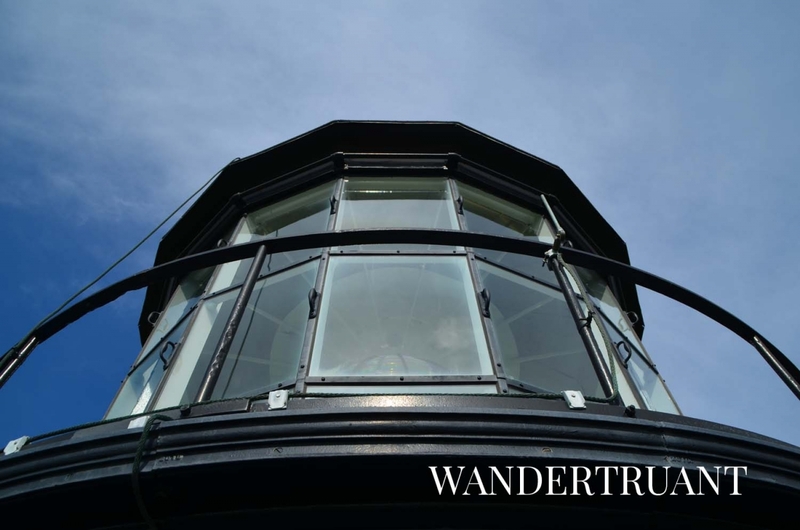 The lighthouse has recently undergone renovations that made it available for the public to climb. Small numbers of climbers are allowed to ascend the lighthouse every half hour, so I purchased an $8 ticket and wandered the grounds until the next climb was available. Like the Currituck Lighthouse, Bodie Island has no air conditioning and is a fairly strenuous climb – 214 spiral steps to the top of the 165 foot tall structure. 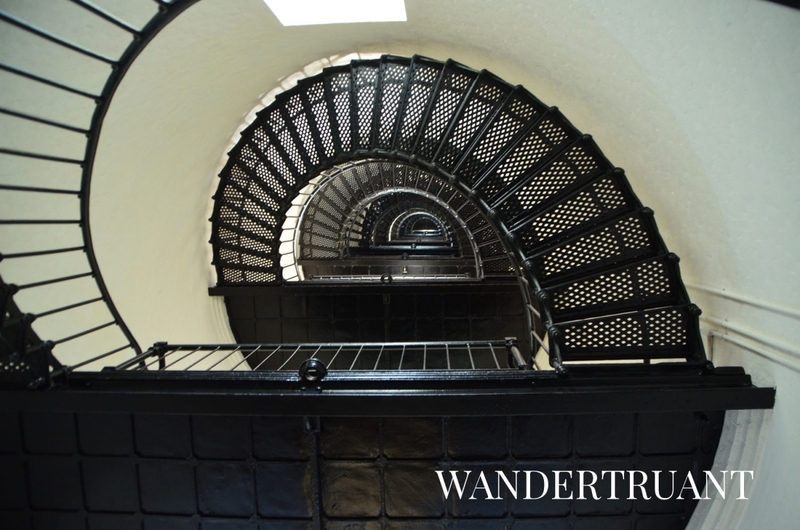 When climbing the lighthouse, only one person is allowed on a flight of stairs at a time, which makes for a slower paced ascent. Climbers were instructed to slowly complete a flight of stairs and rest on the landing, and then check the next landing to make sure it is vacant before attempting the next flight. 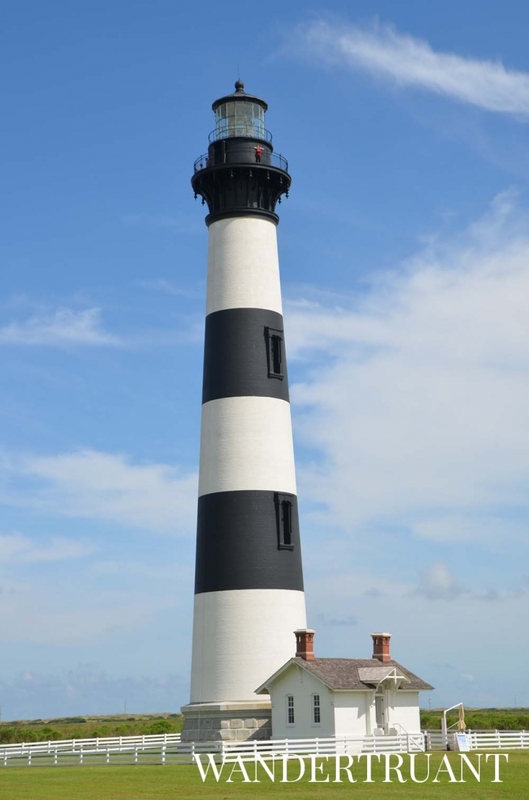 Bodie Island Lighthouse is an imposing figure, painted with large black and white stripes to have it visually stand out from the other lighthouses in the area. Each lighthouse that dots the North Carolina coastline is painted in a different pattern to help distinguish each light from one another. Built in 1872, the Bodie Island Lighthouse is one of the few remaining structures to retain its first-order Fresnel lens, which still shines brightly at night. Traversing the 214 stairs up is exhausting, but the breathtaking view on the balcony of the lighthouse makes it worth it. There were two friendly rangers stationed at the top, answering questions about the lighthouse, the grounds, and the area. 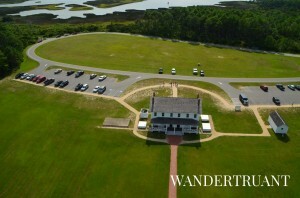 From the lighthouse you can see the Roanoke Sound and Oregon Inlet, and an iconic view of the North Carolina coastline. 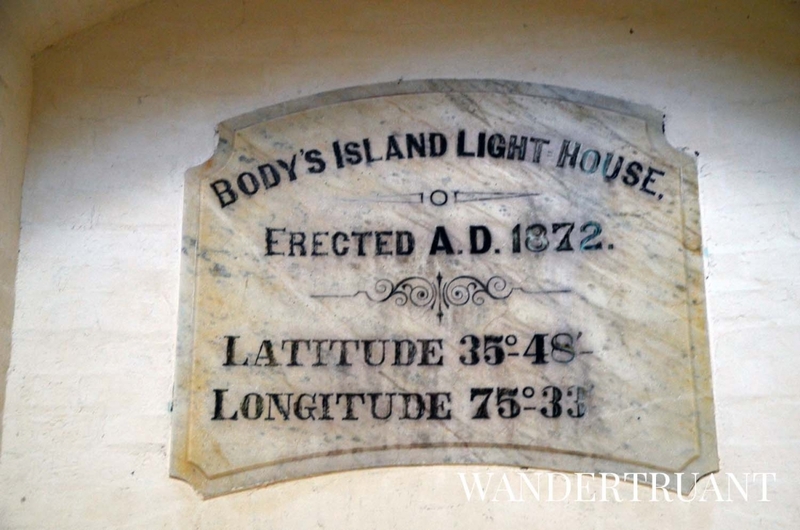 Interestingly, the Bodie Island Lighthouse has a plaque inside on the main level, with the name of the structure and the year it was built; however the name is spelled “Body.” This is due to the original name of the island, which was once owned by the Body family. The use of Body and Bodies is interchangeably used when referencing the lighthouse. 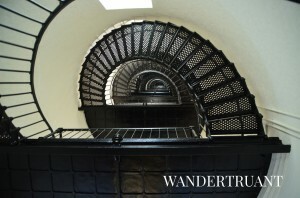 This was one of my favorite lighthouses I encountered on my Outer Banks excursion. 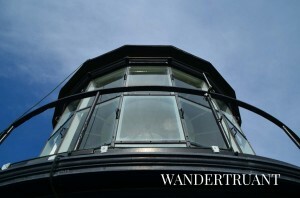 The lighthouse and grounds are beautifully maintained and very serene, and having a limited number of people allowed per climb meant low stress and not feeling rushed to the top. 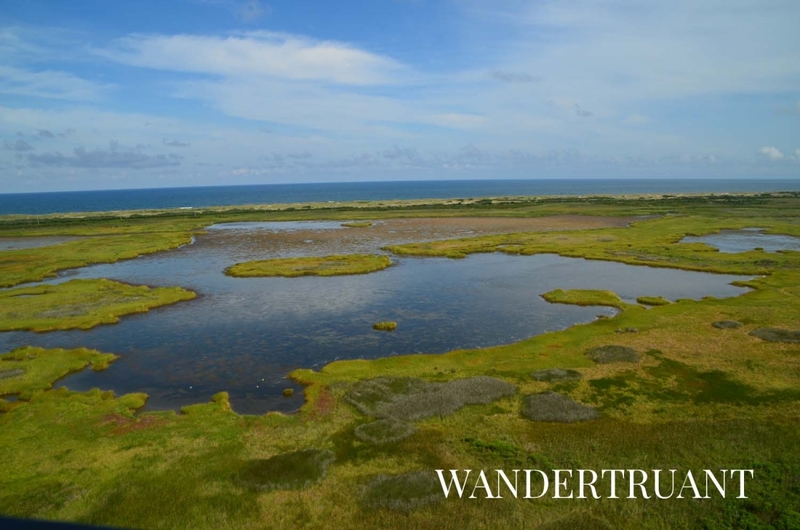 After visiting Currituck, being able to see the difference in the shoreline between Corolla and Bodie Island/Nag’s Head was a great way to truly understand the scope and expanse of the Outer Banks. 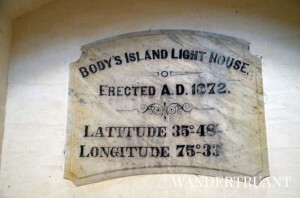 Its been awhile since I ve visited the Bodie lighthouse so I enjoyed your article about it.